Metal-organic framework (MOF)-derived functional carbon matrices have recently attracted considerable attention as energy-storage materials. However, the development of MOF-derived carbon materials with hierarchical structures, capable of thoroughly preventing the “shuttling᾿of polysulfides, is still a major challenge. 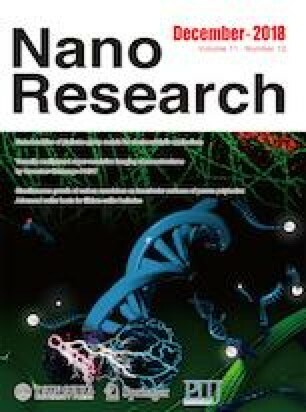 Herein, we synthesized cobalt nanoparticle-containing porous carbon polyhedra with in situ grown N-doped carbon nanotube (CNT) backbone (NCCNT-Co), using zeolitic imidazolate framework-67 (ZIF-67) as starting material. The obtained NCCNT-Co, with interconnected N-doped CNTs on both inner and outer surfaces, possesses an integrated conductive network, which can further accelerate the transport of electrons/ions inside the whole sulfur cathode. 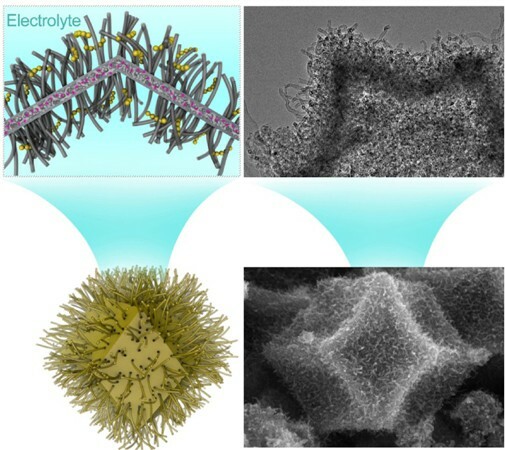 The mesoporous structure derived from the ZIF-67 matrix and the densely immobilized CNTs, coupled with the homogeneously doped N atoms and Co nanoparticles, can efficiently trap lithium polysulfides (LiPSs) by physical confinement and chemical interactions. Furthermore, the hierarchical structure of the porous carbon polyhedra enables a high sulfur loading of up to 76 wt.% and can also buffer the volume changes of active sulfur during the lithiation process. As a result, the NCCNT-Co-S cathode delivers a high initial specific capacity of 1,300 mAh·g−1 at 0.1 C, along with a high capacity of 860 mAh·g−1 after 500 cycles at 1 C, with an extremely low capacity decay of 0.024% per cycle. Supplementary material (SEM and TEM images of ZIF67; TGA curves of ZIF67; Raman spectra of NCCNT-Co and NC-Co; digital images of lightened LED; performance comparisons) is available in the online version of this article at https://doi.org/10.1007/s12274-018-2130-9. The authors are grateful for the financial support from the National Natural Science Foundation of China (Nos. 51433001 and 51373037), the Program of Shanghai Academic Research Leader (No. 17XD1400100), Natural Science Foundation of Jiangsu Province (No. BK20150238), and the Project Funded by the Priority Academic Program Development of Jiangsu Higher Education Institutions.